Thanks for all your lovely comments about our big Christmas tree in Part One! 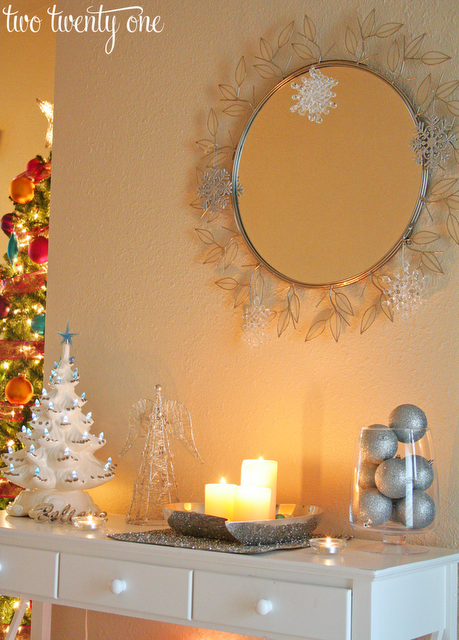 Today I’m showing you our entryway table and little Christmas tree. I started decorating our entryway table in silver and blue/turquoise last year. I love the color combination. 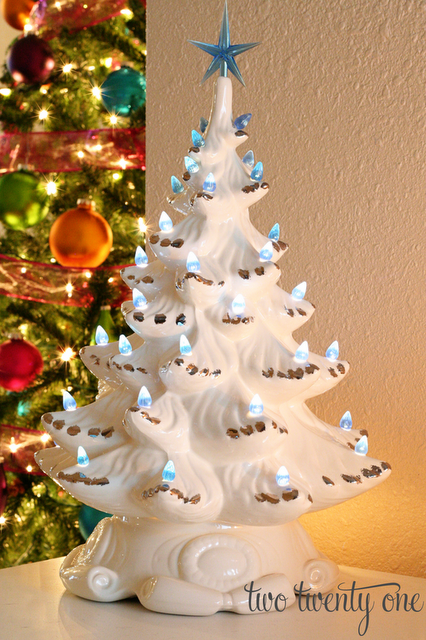 The white and blue Christmas tree was a gift from my late Aunt Patricia. She made a tree for both my brother and I when we were little. My mom used to put them in our bedrooms at Christmastime. It’s one of my most treasured possessions. Everything else on the entryway table is 2+ years old. I believe the angel is from Home Goods. The silver heart bowl and ornament filler are from Target, the silver sequin placement is from Kohls, the silver ornaments are from Hobby Lobby, and the glass container is from Home Goods. I also put up a 4 foot Christmas tree in our entryway. It’s used to display our fun and sentimental ornaments. The wreath was made by Brad’s grandparents. You’ll find ornaments dedicated to Jack, IU themed ornaments, ornaments we picked up while vacationing, “Brad and Chelsea” ornaments, and some other random ornaments. (Yep, I wrote “ornaments” 5 times in that sentence.) I’m disappointed that the personalized wedding ornament I ordered hasn’t arrived yet. Hopefully it will come soon so I can show it to you. 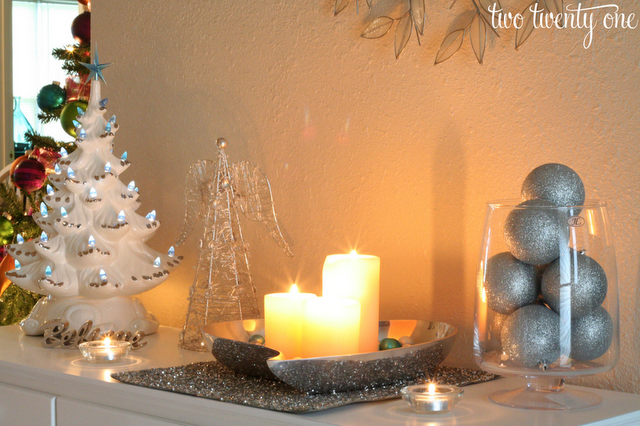 Come back for Part Three where I’ll show you our dining room table decor and a Christmas vignette. How do you decorate your entryway? Do you have a treasured Christmas item? Check out more entryway table vignettes I’ve put together! I just love the color scheme of that table. So pretty! So pretty! Come decorate my entry, please? 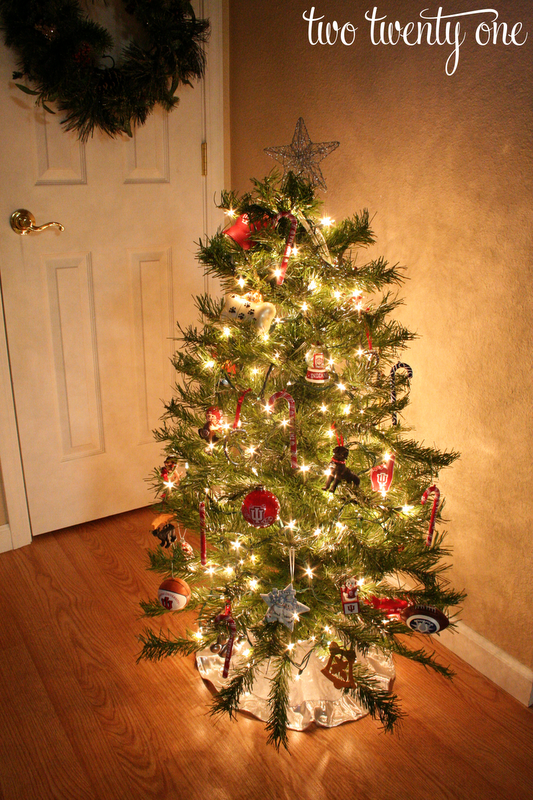 Not sure I commented on Part 1, but yes, all of your Christmas decor is beautiful and very fun, love your big tree!! Love blue and silver entry way, and your fun Christmas Tree. Can’t wait to see the rest! I love that little tree that your Aunt made. Some of my most favorite things for Christmas were passed down from my mom/grandma. I did the same thing with our smaller tree in our loft.. all of the random/memorable ornaments live here. I love the tree from your aunt! I love the special touches/items from loved ones! Elizabeth, I purchased the ornament from Lenox. Ooooh!! Such gorgeous pictures! Stopping by from M3B. My grandmother made a similar tree that your aunt made! I’ve always loved it and always wanted to make one of my own but I don’t even know how she went about it. Its a prized Christmas decoration in my family! I like you white theme on the table and I love that little tree! Oh my gosh our trees are like twins! that is so cool! Thanks for sharing!